BROADVIEW, Ill. – Seven undocumented immigrants were arrested for sitting down at the Broadview Detention Center here today. They were leading a demonstration of more than 150, calling on the Obama administration to suspend deportations, which they say are tearing families apart. 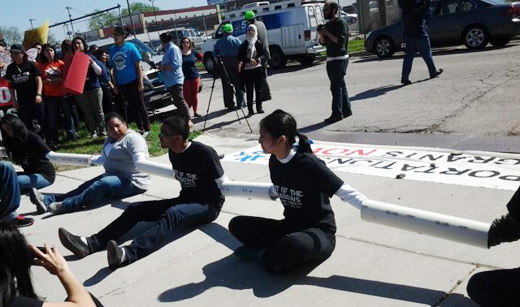 Linking arms together with pipes, chains, and locks seven demonstrators sat down in front of the facility at which undocumented immigrants are being held, awaiting deportation on planes out of Chicago’s O’Hare International Airport. They were arrested when they refused police orders to move. Demonstrators said they were aiming their demonstration and their acts of civil disobedience also at Illinois state lawmakers who they say have not extended enough support to their cause. The seven who led the demonstration and were arrested today have all been directly affected by the nation’s immigration crisis. The detention center is the final stop for many undocumented Illinoisans – especially in Chicago – who are in the process of being deported. From there, they are forced to ride on airplanes that take them from O’Hare Airport to countries that are no longer their homes. Among the seven leaders of the action at the detention center today was community member Xanat Sobrevilla, 25, an organizer with the Immigrant Youth Justice League (IYJL) since 2011. She has helped organize numerous activities, including National Coming Out of the Shadows events, where immigrants reveal their undocumented status with the support of friends and their community; and “Shout It Out” events that underscore the importance of mental health advocacy for undocumented people. In 1996, Sobrevilla emigrated to the U.S. with her family from Mexico City. She graduated from the University of Illinois in 2009 with a Bachelor’s of Science in Integrative Technology. She has volunteered at Rush University Medical Center, and hopes to attend medical school in the near future. But that future is threatened if the deportations continue. Sobrevilla’s fears hardly seem unjustified. In 2012 alone, the Department of Homeland Security announced the record-breaking deportation of 409,000 people, surpassing a required 400,000-person quota. Of those deported, very few had criminal records. On the other hand, the deportations have caused rifts in families and neighborhoods, both of which continue to be targeted. Stephanie Camba, 22, also of the seven, came to the U.S. from the Marshall Islands. Here, she attended the University of Illinois, studying Human Development and Family Studies. Her belief in the value of families and the importance of their safety in their neighborhoods necessitated her involvement in the civil disobedience, she said. Many undocumented activists note that fear of the police on the part of immigrants without papers is detrimental to building the kind of community-police cooperation needed to keep neighborhoods safe. Hugo Dominguez, 23, is originally from Mexico City. He said that although he is happy because his father and younger brother are now legal U.S. residents, his mother is not, and he fears she might be in the wrong place at the wrong time and end up being deported. His encouragement from his family played a large role, he said, in his decision to attend Northeastern Illinois University, where he is now majoring in Communications, Media, and Theater. 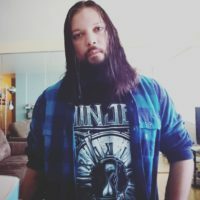 Miguel Martinez is a 22 year-old guitarist from Mexico, who said he does not fear being undocumented, and believes that no one should have to. Jesus Morales, 24, and also from Mexico, is upset by the fact that he has a different legal status than that of his friends, and hopes he will be able to go back to school and further his education.